There was a time when Aghdam, a town in the same-name region of Azerbaijan, was vivid and bustling. Now those days are gone, and the reason for this is the occupation of the region by the Armenian armed forces. This July 23 marks the 25th anniversary of the occupation of Aghdam during the brutal war launched by Armenia in the early 1990s. This was the third painful blow to Azerbaijan following the occupation of Lachin and Kalbajar regions adjacent to Nagorno-Karabakh. As a result of the attack, the town was razed to the ground. Armenians invaded the majority of Aghdam’s territory – they seized 882 square kilometers of the 1,094 square kilometers of territory, including Aghdam town and 80 villages. Some 128,000 people became internally displaced persons, while over 6,000 people died. After the occupation of Aghdam, the UN Security Council adopted the resolution 853, which demanded the immediate, complete and unconditional withdrawal of occupying forces from the Aghdam and other recently occupied regions of Azerbaijan. However, Yerevan remained completely indifferent to the four UN Security Council and UN General Assembly resolutions calling for an immediate and unconditional withdrawal of the Armenian armed forces from the occupied territories of Azerbaijan. Even more damage was sustained in the following decades when Aghdam town was ruined and looted. Today Aghdam is an uninhabitable town and it is often referred to as a ‘ghost town’ by foreign media. Armenian vandals destroyed historical monuments, cemeteries, hospitals, libraries, schools, offices, and other facilities in the occupied territory. As many as 122 villages, around 24,000 residential buildings, 48 industrial and construction enterprises, 160 schools, 65 health centers, 373 cultural centers, a theater, three mosques and two museums were burnt down and completely destroyed. 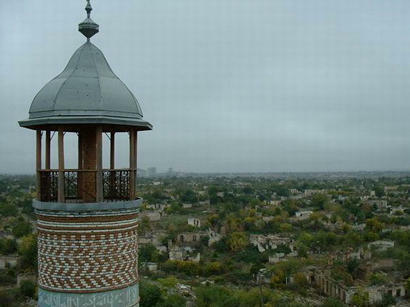 Following the seizure of Aghdam, Armenian aggressors ruined most of the historical monuments of the region. These include the ancient settlement Uzarliktepe, stone monuments in the Kangarli village (14th century), Khanoglu tomb (17th century), the mansion of Panahali Khan of Karabakh (18th century) and his tomb (19th century), and the twin-minaret Juma mosque of Aghdam (1870), the Shahbulag fortress and many other admirable monuments of Azerbaijan. The Armenian occupiers also depleted the natural resources of the region. Eastern sycamore trees aged up to 400 years and other tree species were destroyed in the occupied territories and currently are about to vanish from the world flora treasure. Moreover, arsons committed by Armenian soldiers in the region’s occupied villages resulted in the deaths of various pheasants, vipers, partridges and other animals which are included in the Red Book and the International Union for Conservation of Nature and Natural Resources Red List of Threatened Species. As a result of the occupation of Aghdam, Azerbaijan faced material damage worth $6.179 billion. The damage inflicted to the region’s agriculture alone is estimated at $582.29 million. A quarter-century has passed since the occupation of Aghdam, but Azerbaijanis still wait for the return to their homeland. Regrettably, their desire remains unnoticed by the world community and Armenia keeps ignoring the four UN Security Council resolutions. Azerbaijan is trying to resolve the conflict as soon as possible, while the aggressor Armenia does the opposite by making every effort to preserve the status quo in Nagorno-Karabakh. Currently, 20 percent of the Azerbaijani territories remain under Armenian occupation and over 1 million of refugees and IDPs have to live far away from their homes in hope of returning there someday.